Richard Guldin spoke about the information products from the USDA Forest Service's Forest Inventory and Analysis program, including insect and disease risk maps. Foresters from as far away as Guyana, Ireland, and South Africa talked tech for three days at the Esri Forestry GIS Conference, leaving with a deeper knowledge of how GIS applications can improve forest management and operations. 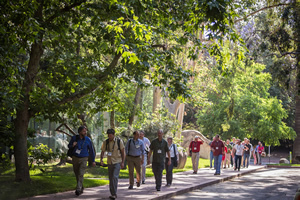 The conference, held last May in Redlands, California, drew forestry professionals from land and timber companies, government organizations, and universities. The Esri Forestry Group, which hosted the event, invited highly regarded speakers who were able to show the value GIS adds to forestry, timber operations, and land management. The keynote speaker was Richard Guldin, acting associate deputy chief for research and development, US Department of Agriculture Forest Service. Guldin leads the Forest Inventory and Analysis program (FIA), which is the nation's forest census. FIA staff use GIS to depict how much forest there is; what it looks like; whether forested areas are increasing or decreasing; whether the United States is gaining or losing species; how quickly trees are growing, dying, and being harvested; and how the forest ecosystem is changing. 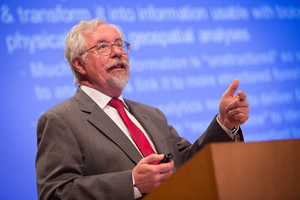 Guldin described FIA products such as insect and disease risk maps, Landsat tree cover change depictions, wildfire trends and severity analysis, and the national land cover canopy layer dataset. He mentioned the forthcoming release of the Forest Atlas of the United States, which is expected to be published in 2014 as a printed book. It will also be available as a data service that will include data layers built from many data providers and links to other data repositories such as Esri ArcGIS Online. 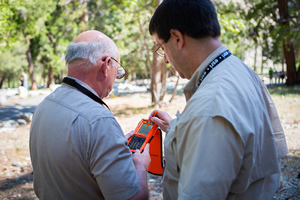 Some of the Esri Forestry GIS Conference attendees worked with mapping apps in the field. "Our inventory information is the best information that exists on the health and productivity of America's forests," Guldin said. "ArcGIS Online provides a solid platform for people to use this information for analyses by using toolsets from Esri or other organizations." Tom G. Boggus, Texas state forester and director of the Texas A&M Forest Service, talked about the new wildfire assessment portal TexWrap. A user can enter an address and see the wildfire risk within a 20-mile radius of a home. Brent Keefer, vice president, Hancock Natural Resource Group, and director of resource planning and investment strategy of the Hancock Timber Resource Group, described how GIS timber investment management organizations (TIMOs) use GIS to address business challenges. GIS helps agents perform third-party appraisals, update annual investment models, provide client account and investment performances reports, and respond to a dynamic timber market. Haimwant Persaud, assistant commissioner of Guyana Forest, manages forest resources information for the Guyana Forestry Commission. He explained the role of GIS for rain forest conservation. Persaud's team implemented a forest monitoring system for Guyana that includes a forest stratification map that shows different layers of vegetation. A group of forestry professionals stroll among the trees on the Esri campus in Redlands, California. D. James Baker, director of the Global Carbon Measurement Program at the William J. Clinton Foundation, also spoke. He explained the Clinton Climate Initiative to work with forestry programs to reduce carbon dioxide emissions and alleviate poverty in developing countries. The initiative fosters carbon credit exchanges between industrial countries and countries with large areas of rainforest. Participating nations, such as Guyana, with its large rainforest, use GIS to assess forest area change and monitor forest carbon sequestration. It provides an unbiased scientific approach to carbon sequestration measurement. The conference provided opportunities for attendees to participate, network, and learn. Users hung their maps in the Forestry Map Gallery and took the stage to give five-minute presentations about their GIS tools and applications. They participated in daylong field labs and hands-on technical workshops. Attendees had time to talk with forest technology partners in the GIS Solutions EXPO and meet with Esri technical services team members to get help and direction. They also honed their technology skills by attending a field lab. Many presented papers about their forestry projects. These are available for free on the conference website. You can also watch these videos from the conference. The community of GIS foresters continues to grow. The Esri Forestry Group now has 3,200 members who use ArcGIS to manage their forests. Foresters who join this user group will receive event and community resource announcements, get a free subscription to Esri News for Forestry, and stay connected with other users.